PROMOTION: Save 40% on ACEVOG Women's Casual Loose V Neck T-Shirt when you purchase 1 or more ACEVOG Wrap Travel Cardigan Sweater. For Women's Casual Loose V Neck T-Shirt, please search AVH025652. 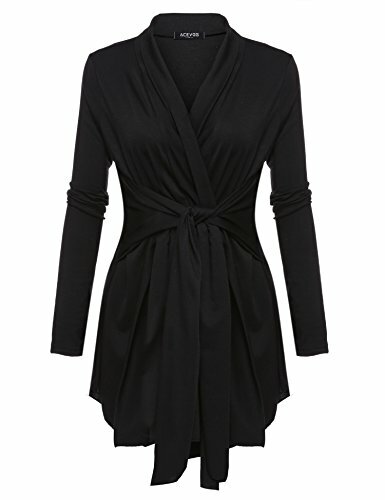 FEATURES: Long Sleeve, Belted, Open Front, Asymmetrical Hem, Lightweight. Wrap Cardigan, Travel Swaeter Cardigan for Women. Warm Cardigan Jacket Coat for Autumn and Winter. HIGH QUALITY: Made with the Highest Standard in Quality and Durable Material. Pair this Cardigan with a blouse, jeans, and flats for a casual outfit. Perfect for casual occasions such as work, office, traveling, presentations, school, or going out with friends. STYLE: Our Cardigan is Specially Designed to Suit Any Occassion from Classy to Elegant and Perfect for Daily Wear. It is Gauranteed to Give You That Perfect Stylish Look. NOTICE: Before Order, Please Carefully Read the Size Chart We Provided in the Pictures (Not Amazon Size Chart). 4.Pictures may slightly vary from actual item due to lighting and monitor. ACEVOG is a professional brand that specialize on women's apparel. We covered the best styles and the latest fashion trends that shows elegance, beauty and life which brings out confidence for every women. Each is a unique design. US M------Bust 35.1"------Waist 26.1"-------Length 54.2"
US L-------Bust 35.9"------Waist 27.3"-------Length 54.6"
US XL------Bust 38.6"-------Waist 32.0"-------Length 55.8"
US XXL------Bust 42.5"------Waist 36.7"-------Length 56.6"